SISGAIN helps & understand enterprises from small to large those are deeply rely on Enterprise Resource Planning (ERP) systems that can support their operations. In such organizations every segment, from transactions to communications, operates and managed through customized applications. Powerful, Highly Customized ERP System built based on in-depth analysis and understanding of your business requirements and processes will help you to carryout effective operational planning and administration and will also enable you to optimize your internal business processes in order to achieve overall efficiency. A well-planned and developed ERP Software system effectively integrates all disintegrated data and organizational processes including Financials, Customer Relationship Management, Manufacturing, Human Resources, Warehouse Management, Inventory and Supply Chain Management etc. Into a single unified system that gives management and employees a ring side view of business operations which in turn enables them to take informed business decisions that lead to transparency, speed and efficiency, cost-saving, better control & work flow and ultimately increased profitability. ERP, Enterprise Resource Planning development, is business management software that helps companies in using integrated applications to manage the business. The remarkable aspect of this system is that it integrates different types of business operations. Looking into the need of accuracy and efficiency in an organization, such software is deemed to be lot helpful to lay down the foundation of future growth. It improves upon the productivity and saves costs. 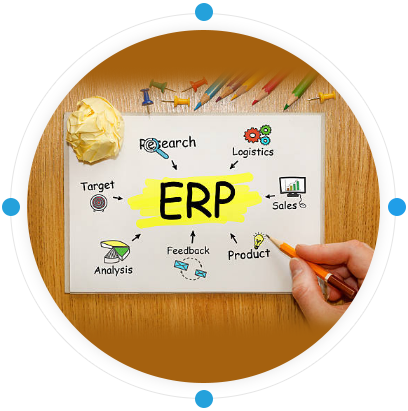 We follow only latest methodology which is the key for building successful ERP Development Solution.